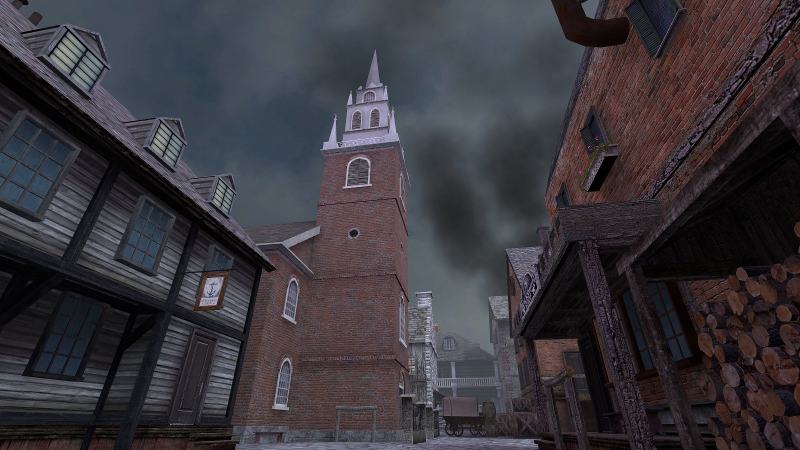 Short description: It is late fall in the year 1775, and the rag-tag American forces are besieging the city of Boston. During the siege, a small contingent of American forces break out into the city. There, the final few British soldiers hold the last line of defence, in a quaint townhouse. The Americans must assault the enemy position using explosives, secret passageways, and brute force, while the outnumbered British must use clever defence and tactical teamwork to hold to the last. Will the British be able to hold their line and eventually take back Boston, the pearl of the empire, or will the rebels finally drive out the invaders and secure the future of their young nation? The fate of the land, the fate of the world, rests in the balance. Additional notes: This is the first version of the map, so there probably will be balancing fixes and changes that will need to be made. I might have forgotten to pack in some textures, so some texture might be missing. I think I got them all though. The cfg for the map is included inside the .zip file. Last edited by Awesome on Mon May 23, 2016 6:57 pm, edited 4 times in total. Looking great. On 3D server for testing. Danced around on it a bit and seems pretty good with nice sound effects. Only hitch is purple and black checker board on some buildings. Looks like some missing VMT or textures. Thanks for the feedback everyone! I updated the map to sg_boston_dev2, the updated link is in the original post. I fixed the missing textures and reduced the amount of rounds from nine to seven. I will make more adjustments to the cfg once I see how the map plays out. 7. Added walkway in the first part of the tunnel the Americans enter, so that they can move into the sewers somewhat faster and to somewhat discourage the British from camping at the bottom of the well. 8. Made it more difficult for Americans to jump/boost onto the blacksmith roof area, so as to somewhat secure the potential British position in the construction house. The updated link is in the original post. To comment on how the map is playing (I think we've only played it one time so these are just first thoughts), the map is much more open than my previous siege maps. Yes, there are lots of choke points that the Americans have to overcome, but in none of these locations do the British seem to have a dominating advantage. There are fewer fort walls, fewer distinct borders between British and American territory. Rather, the British only hold a general advantage that is spread out across the map. I like that. Because of that openness, I simply can't wait to play a competitive match on it and see what tactics and strategies come up. Perhaps the British will push out onto the construction house and arrogantly defend. Perhaps they will push out onto it, but then strategically retreat so as to delay the American's advance. Perhaps they will not push out at all and instead strictly hold onto the townhouse. Maybe they might do all of that, but then the Americans quickly rush through the sewers and storm the British townhouse before the British have time to turn back and defend it. I can't wait to see. I updated the map again, download link is in original post. •Fixed bug where players couldn't shoot or stab in certain sections of the sewer. •Decreased the amount of British tickets from 28 to 26. •Fixed bug in bottom of well where players could get "pushed off" a platform because lag compensation thinks they can't walk in that certain area when in fact they can. •Americans can now walk from sewer area up the staircase and into British spawn without jumping; it will now be harder for the British to strictly defend from their spawn area. This way the British are more encouraged to hole up farther down in the sewer area. •Reduced the height of the window in the cafe area so it might be easier to use it to shoot down at the Americans. •Rotated wooden chair in the construction house so it can be pushed down the staircase by the British, forming something of a barricade. •The bomb cart will now travel on its own without someone pushing it, but only from American spawn to a point just around the street corner. Nobody will have to push it down that first empty stretch of road. •Moved the flag capture area from inside the house to the balcony outside. This is makes the flag much more capture-able for the American team, giving them an incentive to attack through the being-built house and the cafe, and giving British team more incentive to defend that area. Also, the flag is now a 2-person flag and is an "American Only Target." •Reduced the amount of American tickets from 50 to 44. This is possible due to the Americans' increased ability to stop the ticket drain by capturing the flag, encouraging them to do so. This also has the side effect of slightly reducing the effectiveness of an attritional front-on attack that Karpik's team did in the sewer. •In the sewer, two breakable brick walls have been added on either side of the iron-bar window. The Americans will have to spend time breaking down these barriers before they can progress. Each wall has maybe 15 bricks, and each brick takes two stabs to destroy. •In the sewer, the two ramps used by the Americans, leading up to the iron-bar window, have been made thinner so that Americans will no longer be able to jump between the two.